The clear hull gives you some insight into the inner workings of this massive 1 ounce rifled slug that is made for hunting large game. This is a premium product at a standard price. Sellier & Bellot can make that claim relatively often, as their system produces some of the finest ammunition craftsmanship, and yet, it produces more than ammunition than most other manufacturers combined. The secret is in their facilities and their commitment to the consumer. Like other longstanding ammunition providers, S&B didn’t last for over 200 years without producing a fantastic product and taking care of customer needs. Sellier & Bellot is a great company that produces top tier ammunition. 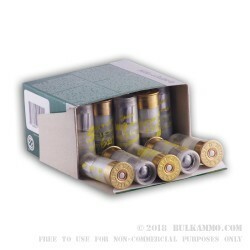 This load is made for large game hunting and target shooting, but could easily be used as a self-defense round, especially for large properties where a threat may need to be engaged at a larger distance. The clear hull gives you instant recognition upon loading/reloading – what rounds you are about to put into your shotgun. 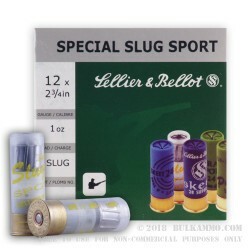 The rifled slug in this shotshell offers about a 60-80 yard range for impromptu shooting, and dialed in, it could easily go out to 110 yards with relative ease and decent accuracy.